Hakusan, Japan, June 12, 2012 – Eizo Nanao Corporation (TSE: 6737) today introduced the FORIS FS2333, a 23-inch full high-definition (1920 x 1080 native resolution) home entertainment monitor. The FORIS FS2333 is designed for gaming as well as other leisure activities such as watching movies and editing photos. It features all-new tone mapping technology called “Smart Insight” with five settings for RTS (real time strategy) and FPS (first person shooter) games that EIZO co-developed with Fnatic, one of the world’s leading professional esports teams. The FORIS FS2333 comes with two other “Smart” technologies called Smart Resolution and Smart Detection. Smart Resolution is EIZO’s own super-resolution technology that analyzes an image for noise and blurring and then corrects the blur without accentuating the noise. This feature is “Smart” because it adjusts only those areas where it is needed. It even distinguishes skin tones and text from other content and optimizes how they are displayed. Smart Detection identifies where on the screen a video or game is being played and applies super-resolution processing to sharpen the image while leaving other areas untouched. 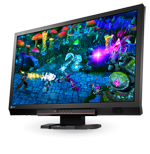 A scaling function is included for those who play games at less than the monitor’s native resolution of 1920 x 1080 but want to take advantage or the monitor’s 23-inch screen size. The scaling function enlarges the image while maintaining the aspect ratio or expands it to fill the entire screen. For amateur digital photography enthusiasts, this monitor is compatible with EIZO EasyPIX, an optional color matching tool consisting of calibration software and a color sensor. EIZO EasyPIX calibrates the monitor’s brightness, color temperature, and gamma to specific values. Auto EcoView brightness sensor that reads the ambient lighting and adjusts the screen’s brightness to the ideal level. * The usage time is limited to 30,000 hours.